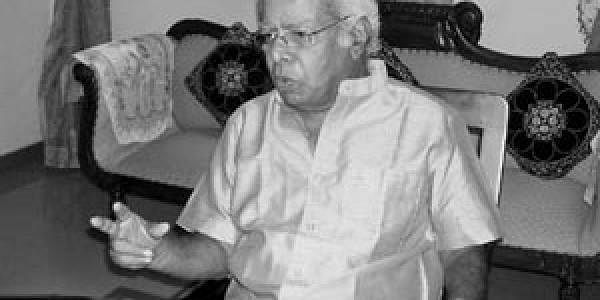 FROM the time he was a youngster, Thilakan had been skeptical about God. “I don’t think He exists,” he says. “Poet Vayalar Rama Varma said that man invented God.” As a result, Thilakan never visited temples, except when he had to perform in a play. “It is not god which is all-powerful, but our mind,” he says. “My left hip is in bad shape. I find it painful to walk, but I continue to lead a normal life, because of my will power.” Having extolled the mind, Thilakan also admits that when good acting takes place, there is a sense of mystery in it. “Sometimes, I am amazed when I see myself on screen. I wonder how did I act like that?” he says. “Definitely, a power has come into me.” He remembers the time when he flew to Chennai with K J Yesudas. During the conversation, Thilakan said, “You speak with a Fort Kochi accent, but when you sing, you use Carnatic phrases and religious slokas in such a beautiful manner. How does this happen?” Yesudas laughed and said, “When I sing, somebody enters my throat and does something.” Thilakan says that Yesudas might describe it as a spiritual power. “Most people will say it is God, but I say it is mental power,” he says. “I may be wrong in my conclusions. At the same time, those who say that it is God can also be making a mistake. Who knows the truth?” He gives an example. “Is your house on the left or the right?” he says. “It depends on where you are standing. At certain spots, your house may be on the left or on the right. The same is the case with God. You can say He exists, but at the same time He might not be there.” Thilakan might wish He is there, because he is at the centre of a controversy for saying that he was denied a chance to act in the film, ‘Christian Brothers.’ It forced AMMA (Association of Malayalam Movie Artistes) to seek an explanation.